Hello lovely people and welcome to our little update on what foody delights have been occurring with us this month. Wow January has been a long month, but as you can see we’ve mainly managed to survive it by eating lots of yummy things! Yay to us right. Steak and potato wedges – the stuff of dreams! Brunch at Tom’s Kitchen. Look out for a post about this soon. What about you lovely people? What have been your food highlights this month? Yes, it’s that time again! A new month, means a recap on what the two of us have been eating, the restaurants we’ve visited and of course what we’ve been cooking. 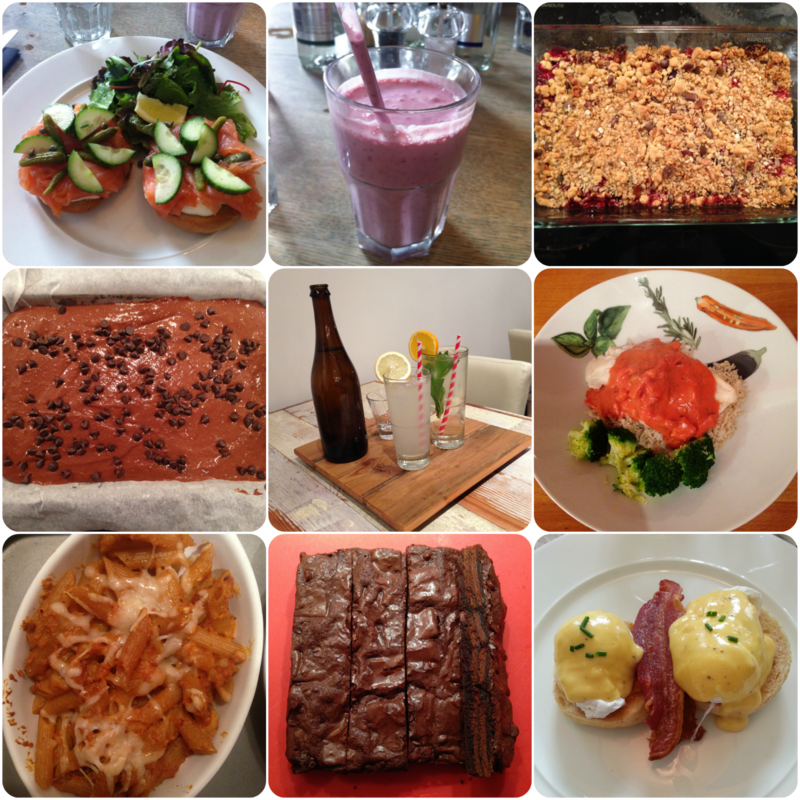 So what have Fi and I been up to this month foodwise? Well in Wales there was vegetarian lasagna of amazingness (as mentioned here), butter buns (extreme levels of delicious) and welsh cakes by the dozen (not even slightly exaggerating here), which reminds me we really should make our own soon…. Then we were in Leeds where we had a delicious Thai meal and a relaxing picnic in Roundhay Park. Aside from the eating out while we were away we also managed to make it to The Yard, Shake Shack, The Seahorse Pub, Flutes at Wembley Stadium, Five Guys, Wagamamas and Del ‘Aziz. Not bad for a month between the two of us! Now for cooking and baking ourselves there’s definitely been more going on this month in comparison to July. We cooked up some turkey burgers with friends in Leeds. Then we both made cakes at seperate times for sharing with work people. I picked whoopie pies to make, you can check out our original whoopie pie post here and my updated one from this time of baking them here. Fi made herself (and her work friends) some oreo brownies from a Lorraine Pascale recipe. Also this month we’ve started a new cooking challenge – read more on that here and keep your eyes peeled for the recipes that came out of this challenge. Plus in other baking related news the wonderful show that is The Great British Bake Off is back. Yippee!! We both just love this show! What about you lovely people, how has your month of food been? Bill’s – I’m sure I must have mentioned my obsession with this restaurant before, after all it’s a go-to restaurant for work lunches or meetings. With scrumptious food like haloumi and hummus burgers, classic doorstop fish finger sandwiches and warm chocolate brownie with vanilla ice cream it’s certainly a must visit when you’re nearby. They also sell lots of gorgeous food like chutney, pasta and sauces, so you can try some delicious cooking at home – win win! Plus the decor and feel of the restaurant is so chilled out and relaxed, so you can sit over a drink or pudding for an age without feeling rushed. The Diner – My obsession with this restaurant is certainly no secret – I think I’ve been about five times this year alone. Sometimes you just need a cheeseburger, fries and vanilla milkshake (with added peanut butter of course) and there really is nowhere better than The Diner on Shaftesbury Avenue for that American experience! Leon – I’m a sucker for their Sweet Potato Falafel, aioli chicken, haloumi and brown rice what can I say. Also because all the food is without additives and other bad stuff I feel like I’m making a good choice when I go here. Even if I go for the chocolate brownie. At least it’s wheat and gluten-free I suppose! The Laughing Buddha – This is the local Chinese where I grew up and I can’t even guess how much birthdays or special occasions have seen us at this restaurant. Honestly, I think this restaurant has spoilt me for life as their Lemon Chicken, Seaweed, Crispy Duck and Sweet and Sour Chicken are out of this world and I’ve yet to find a place in London that even comes close to making it as well as they do. Woe is me! Sandbanks – This beachside restaurant on the Algarve Coast is wondrous. It’s the first place we head to when we land in Faro, as the spicy wedges, salads, club sandwich and chicken and avocado wraps are legendary. Not to mention their fresh orange juice and pancakes with banana and chocolate sauce. And with a gorgeous view over looking the beach and sea, it can’t be beaten when the weather is glorious. Ripley Curry Garden – The most delicious curry in all of Surrey can be found at this small restaurant. It’s everything you’d expect in a family run restaurant – small, friendly and with the most mouth-watering food. Whilst I don’t go for the most exciting of Indian dishes – Onion Bhaji, Bombay Aloo and Chicken Korma – they are all absolutely delicious. I’m sure I’ve forgotten some really excellent restaurants that I love, so perhaps I’ll have to do a second part to this post in the not too distant future. Now I wonder what Lau might choose as her favourites? I’m certain she’ll choose one or two that overlap with mine, but I wonder what else will feature? 5 new dining experiences – Tom’s Kitchen, The Seahorse, Cafe at The Medicine Garden, The Riding House Cafe and The Wolseley. Okay so it looks like we’ve eaten out a lot this month – but I’m blaming that on our birthday fun as 7 of those meals out were part of birthday celebrations. Let’s hope May isn’t the same as I’m not completely sure my bank balance can handle it! We also seem to be a bit low on the new recipes front, again I’m blaming that on the birthday too – any one else seeing a theme here? We do plan on getting these newly mentioned recipes written up and on the blog soon. We’ve been having a bit of a discussion – and by discussion I mean argument! – recently about our favourite foods. You see we may be twins but when it comes to the important things (like food) we just can’t seem to agree. I love apple pie, Fi likes apple crumble, she prefers mashed potato and I like baked. She loves peanut M&M’s, I love plain. She loves bananas and they make me feel ill – yuck! It goes on and on like this and I find it odd. How does this happen, how do children (yes, we’ve been like this for years) who grew up on the same foods have such different taste buds? Yes, you’ve spotted it, most seem to be made by one of our parents – I think it’s clear to see where our food obsession comes from! In fact one motto in our family is ‘live to eat, not eat to live’ and in this case ‘bake’ and ‘cook’ could easily be switched in! I’m also pleased to announce that while we were at home this weekend for birthday celebrations, we managed to squeeze in 3 items from the list above; Roast Dinner, Sausage Rolls (made by Dad, but using Nanna’s recipe – in fact apparently Nanna observed the baking over Skype!) and finally Fi’s Sponge Cake was used as the basis of THE BIRTHDAY CAKE – yes capital’s are needed as it was a pretty special birthday cake that the three Evans sisters made for our Mum. We’ll post about this soon….